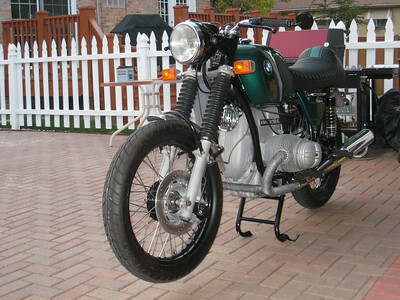 Mike Patterson's 1974 BMW R90/6 old motorcycle repair and restoration of classic bmw airhead motorcycles and their history. I call this the beginning...I call it that because as with most restoration projects this one will take some time. Time being the true limited resource. Never the less, after pontificating to my wife since the day I met her that one day I will own another motorcycle, it happened. 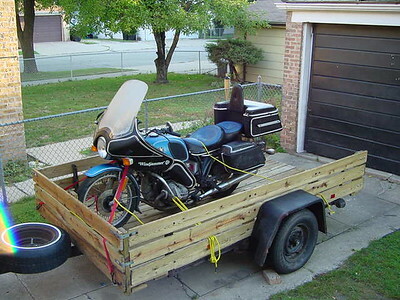 The real reason it happened was because after about six years, Kara (my wife), got sick of hearing me talk about it and said "Go buy some old motorcycle to restore so I can get some peace already" or something to that effect. This is the morning after we brought it from home. That trip deserves a page of it's own. 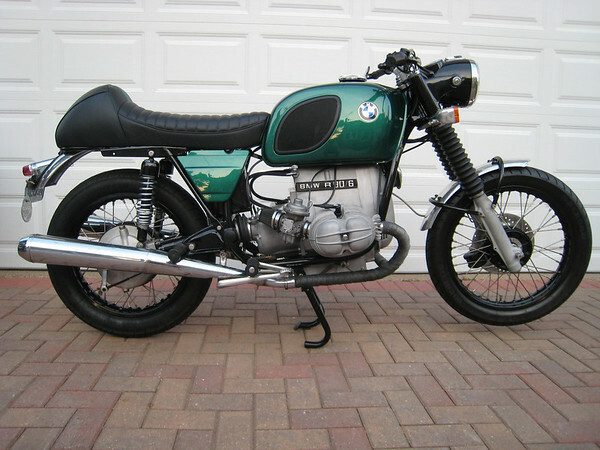 I was looking for a vintage motorcycle and found this motorcycle on Ebay and figured, why not. So on a Sunday afternoon when I won the auction, I sent my funds to the owner. I soon received a call from the old owner to arrange pickup. As it turns out, he wanted it picked up in the next 10 days, which is reasonable, but the best time for both of us was that evening. I live in Chicago and the motorcycle was in Berrien Springs, Michigan which is about 3 hours away. A 6-7 hour road trip sounded like a good idea on a Sunday night (it was 7PM already), but road trip's never go as planned. In short it was 2AM driving home with no trailer brake lights. 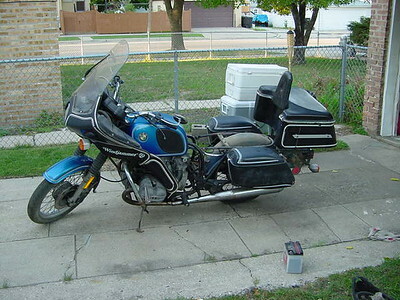 This is what the motorcycle looked like on the day I brought it home. I'm sure someone somewhere though that this was a good look for a bike but not me. I've nicknamed the bike The Orphan, since it was left on it's own for so long. Here The Orphan after some cleaning up. There is a lot left to be done with this bike. I took the bike to Bob's Motorcycle World in Chicago (now closed) just to find out what shape he thought it was in. Bob's first words were "Get a new seat, that's just UGLY!" I picked up a Corbin Dual Canyon which makes the orphan look a lot better. Bob has since retired, but his shop is still there. Under the leadership of Johnny Scheff Motoworks Chicago (1901 S. Western 312-738-4269) was born. They have a great store front with clothing and accessories. Milan at the parts desk is very helpful and the have tons of new and used parts for you project bike. Johnny also has a great service department that handle all vintage bikes. I am thinking of turning this bike into a cafe racer but am not sure yet. I I have a /5 headlight ready to go on but I am waiting until I figure out the rest of the bike. Then possibly some kind of boat tail seat and custom rear fender. I like the coffee can lights off the /2. Then there is the question of what color to paint. I realize black is standard, but I kind of like a deep green. Check out the photo album for a Photoshop job of some colors I was thinking of. I'm always looking for ideas. You can send me an e-mail at "mike at pattersonchicago dot com". The project is done...New updates and pictures coming soon. BMWMOA BMW Motorcycle Owners of America CafeBoxer.com Nice BMW site from Chicagoan and BMW Airhead rider Craig C.